This wreath may be one of my favorite Halloween decorations I have. I pinned something similar on Pinterest last year, but they place they suggested to get eye balls made the wreath cost almost $60! No thank you! I made this one for $6. I bought several of these wreaths last year after the holiday for $0.50 each. The eye balls were a dollar a bag from The Dollar Tree. I was so excited when I saw them there. 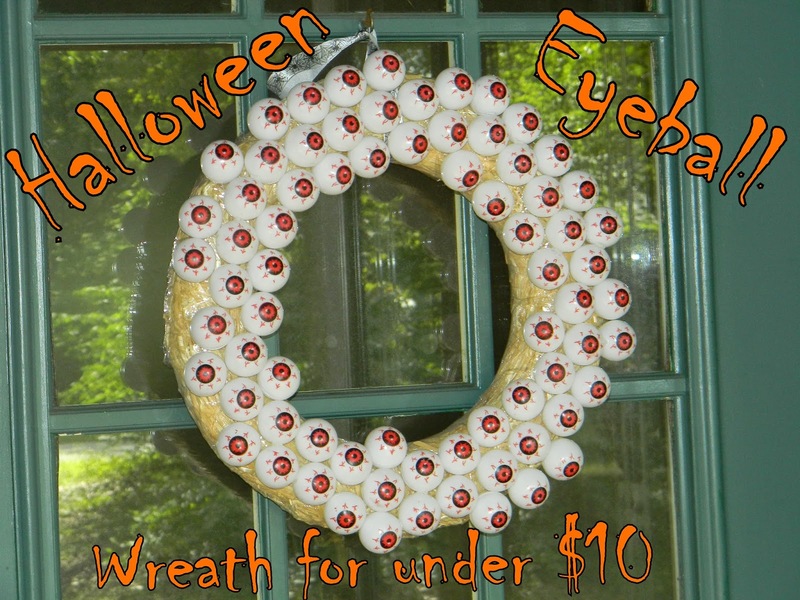 I bought 7 bags of eye balls, but only needed 5 to cover the front of the wreath. I could add more around the edges but I worry they'll fall off when I have to store it after Halloween is over so I just did the front. I just started hot gluing them on one by one, making sure all the pupils pointed the same direction and worked my way around the wreath. When I was almost all the way around I hot glued a halloween ribbon on it so I would have a way to hang it up. I held it up and filled in some of the empty looking spots and then hung it up and stared at it all day. I was so proud! It hangs on our front door and I did add some window cling bats so the whole door is mighty festive and ready to scare the kids. However, now that we live in the country I doubt anyone besides my family will even see it. I wish I would of covered the wreath with some orange or black ribbon or tulle just to hide the straw a little more, but when I started I was too excited to think about that.